We were able to quickly adjust to life back in San Francisco. 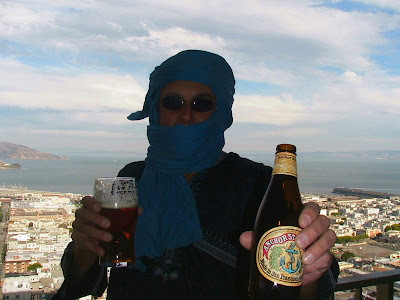 You can tell because I am enjoying a local brew on the terrace - San Francisco's own Anchor Steam beer. I am wearing the shesh we procured for the camel ride to Arouane (which - thanks to the internet, I am now an expert at wrapping), the shirt and pants that were a gift from Hamidou in Timbuktu, and the sandals from Dakar. My high-rise neighbors were probably wondering whether terrorists had moved in across the street. We were delighted and surprised when the beautiful Alpha Sow ceramic pot we purchased in Dakar arrived undamaged a few days after we returned. We have had remarkably good luck over the years purchasing fragile art objects in 3rd world countries and shipping them home. In the process there is always a very nervous-making moment of handing over a large pile of cash and a hand scribbled address to somebody you don't know in a country you are unlikely to visit again. You hope that a fragile object d'art will follow you home unscathed, but suspect you will never see the object or your money again. Then it arrives. Much happiness ensues. So far we have a perfect record. Well, two days really. To be precise - it was a bad 30 hours. In my previous life, when I traveled extensively peddling expensive enterprise software, I would set my expectations for just how bad a day might get by the number of airports I would traverse. A five airport day was always a bad day. Leaving Timbuktu we had a three country, five six airport, 30 hour day. It was a really bad day. 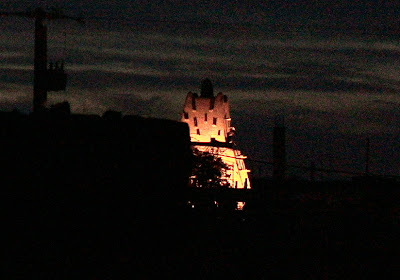 It started ok with first light in Timbuktu. 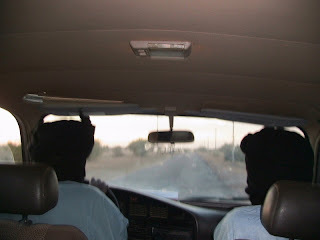 Bouj and a blue turbaned and enrobed Tuareg driver picked us up at dawn and dropped us at the Timbuktu airport. 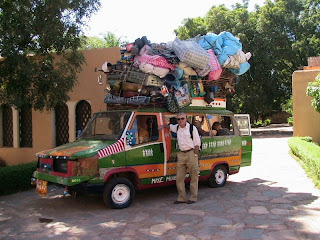 We worried about the baggage weight - as we have collected a few more kilos of stuff since departing Dakar a few weeks before. We paid some extra fees and were on our way. We were told this was a refueling stop. We had to exit the plane, but I don't remember whether we had to change planes. I just remember noticing a particularly ugly helicopter and jet on the tarmac and thinking "Must be Russian". The Russians make the ugliest looking aircraft in world. 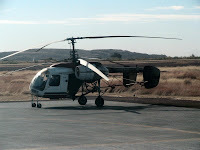 But they're workhorses that fly anywhere with limited maintenance requirements. Including the Sahara desert. "Fly to Bamako, the lively Malian capital on the banks of the Niger.... we will visit the ethnographic museum, the best in West Africa, with its wonderful collections of ancient art objects, masks, sculptures, traditional weapons, textiles, musical instruments, and tools. Evening transfer to airport and depart on our flights home. 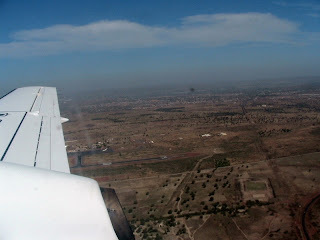 You can depart from Bamako any time after 5:00 p.m. B,L,D…Dayroom"
When we landed, there was no one there. Sigrid borrowed a cell phone from a stranger waiting at curbside, and called the manager of the local tour operator. Long/short - They knew nothing about our arrival, but after a few encouraging words from Sigrid, agreed to deliver the promised services. Three months after returning to the States, Mountain Sobek tried to charge us additional fees for that day in Bamako. Not. Just to be clear. We were happy overall with the Africa based tour operator, but felt the stateside Mountain Sobek overlay contributed nothing but promotion of the tour. So we spent a few pleasant hours in Bamako with a hastily arranged driver and guide. Relaxed in a hotel day room, and then back to the airport and out. Thinking about it now, if we count the Bamako airport twice for the two visits coming and going, it was actually a six airport day. 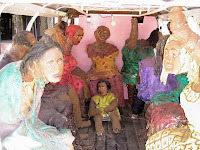 The flight from Bamako to Dakar was uneventful. But the longest night was about to begin. We had another six hour layover before our flight to London and our intent was to wait at the airport. We landed at 1:00 AM in Dakar and needed to collect our luggage to recheck on the flight to London. Our experience this night was much different than our departure from Dakar a few weeks before. Then, Henri's driver helped us navigate the airport and we sailed through. Now we were living in the underbelly of the beast for six hours. The airport was hot, humid, and dirty. Even getting the luggage was distressing. It was a long wait for the luggage to appear. Peeking through the ports where the baggage carousel/track ran out to the tarmac, I could watch the handlers in action. They hated their job or hated the fact they were working that night or both. Bags were literally thrown with force into and near the carts, and then again on to the baggage carousel. Many bags on the carousel were split or damaged and the contents spilling out. Miraculously, all our bags arrived and were undamaged. For reasons that pass all understanding, we had to run the baggage through a non functioning x-ray machine in order to leave the baggage area. We exited, and reentered into the ticketing area to wait for dawn and our next flight. None of the airline counters were open. The airport had no services or even anywhere to sit except for a few scattered hard plastic chairs. Piling the bags in a corner near a kiosk, we arranged things as best we could and spent the night trying to find some small level of comfort. We didn't. It was so miserable, that we did not even think about taking pictures. At dawn the terminal began to fill with travelers waiting for the counters to open. We finally boarded the British Midlands flight, collapsed in the frequent flyer point business class seats to London and a return to the Heathrow Sheraton for an overnight stay. Neither of us had any desire to take advantage of our last night in London. We just stayed in the hotel room. I left the room only to walk across the street to get dinner from McDonalds. 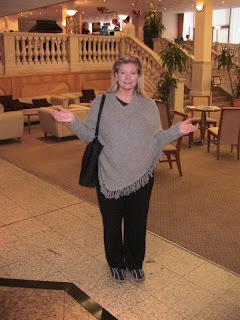 Sigrid models her "clown shoes" in the lobby of the Heathrow Sheraton. 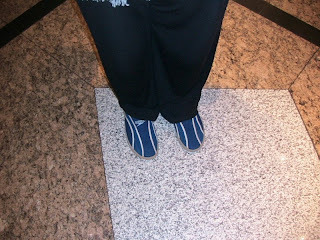 Wes loaned her the shoes after she injured her toes on the hike in Dogon country. They were the only shoes she could wear. The next day, we chased the sun back across the pond and home. 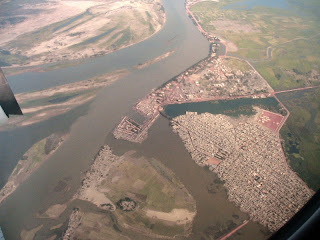 The Timbuktu canal flows again. A sunset visit to the reservoir at the termination of a new canal connecting Timbuktu and the Niger River delta was the last stop on our tour with Mohamed and Hamidou. High on a dune, across a stretch of soft sand directly behind the Hotel Azalai (visible in the background of the picture above), amid a festive atmosphere, hundreds of people walked and smiled and wondered at the water in the reservoir. We were surprised to learn that this water was not there when our tour group arrived at Hotel Azalai, only three days before. Serendipitously, we happened to be in Timbuktu at the very moment this four year project was completed and the water started to flow. "They crept into Timbuktu, destroyed it, took the books and threw them in the Niger River, turned the mosques into stables, and filled up the canal, which was conveying water from the Niger River to the town, with earth. I visited the canal today. Your Libyan brothers decided to re-dig this canal to move water from the Niger River to the town. God willing, water will come soon from the Niger River to the town through that canal which was once filled up with earth by the colonialists." - Colonel Muammar al-Gaddafi in Timbuktu, Mali - Q-News, Issue 368 Sep-Oct 2006. Trees planted in the dunes on the bank of the canal. In many ways this picture is emblematic of the new Timbuktu emerging out of the Sahara sand. Our tour guide Mohamed , a young multi-lingual Tuareg and practicing Muslim, eager to share his Timbuktu history and heritage, proudly displaying his new Nokia cell phone/ mp3 player containing traditional Tuareg music, the music of the late Mali mega star Ali Farka Touré and James Blunt, standing in front of a canal with Niger delta water flowing to Timbuktu for the first time in centuries, since before the colonial occupation. It was a perfect way to put a period at the end of our short stay in Timbuktu. I expect we will barely recognize Timbuktu five years from now. 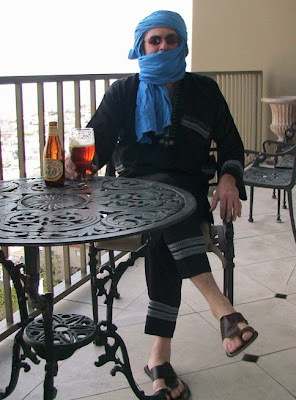 "Timbuk-tour" and the Tuareg dissent. Panorama of the Sankore Mosque, from the roof of the Al Imam Essayouti Library. As agreed at dinner, Mohamed met us at 10:00 AM with a driver. We set out for a Timbuktu morning tour before coordinating with Hamidou in the afternoon, putting ourselves in Mohamed's capable hands as he made some tasty tour selections from the Tour Menu (left). First stop was the Sankore Mosque, that showed its recently resurfaced self in a much better light than on the rainy cloud covered visit on Saturday. We also toured a municipal museum of Timbuktu (Tombouctou Koy Batouma - #4 on the sign) said to be located on the site of the town's first residents of Timbuktu. Mohamed explained in no uncertain terms, that the French corrupted the spelling and pronunciation of the town. The correct pronunciation was "Timbuktu", not the French "Tomboctou", and the name derived from a Tuareg woman named Buktu whose well became a destination and reference point for early desert travelers. The city stands on the site of "Buktu's well" or "Tim Buktu". Said well pictured here. Another stop was at Boubacar Sadeck - Artisan Copyist of 16th Century Manuscripts. He was selling a selection of beautiful illuminated framed poems as souvenirs. I had something else in mind. I asked if he could illuminate the inside front cover of the journal I purchased in Burkina Faso and have been diligently filling with my indecipherable longhand since wandering in the deserts of Mali for the two weeks since. I did not have high expectations, as the work would need to applied to the rough recycled paper of the journal, and it would have to be done in one day. We agreed a price - the results exceeded my wildest expectations. "Salt flows from the North, gold flows from the South, Money flows from the country of white men, but wisdom flows from Timbuktu." If only the scribbling inside could live up to the promise of the beautiful sentiment and calligraphy on that gold and copper foil framed preface. Mohamed's Dissent to Maliki's Law. 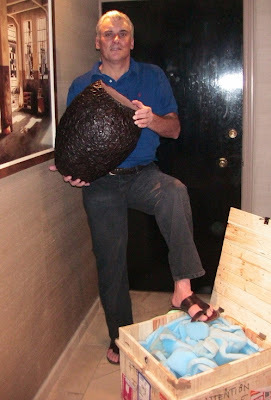 "One wife, - one problem. Two wives - two problems. Three wives - three problems. Four wives - No life." I don't know what library we toured on Saturday with the group, but it was not the Mamma Haidera Family Library as I indicated in yesterday's post. Not sure where I got that impression on Saturday. It was a fine library and exhibit, an interesting stop on Saturday's tour, and served to illustrate the point of that post perfectly well. But it was not the Mamma Haidera Family Library. 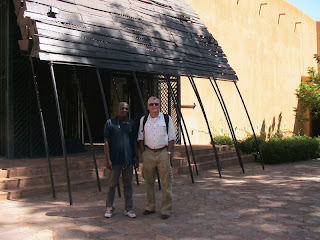 I know that now after touring the Mamma Haidera library with Mohamed and Hamidou on Tuesday. In the lab with the team. Hamidou demonstrates digital documentation of a manuscript page. 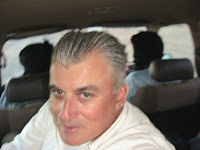 I take advantage of the great internet connectivity at the lab to post to the blog and IM with Harlan. Entrance to the Al Imam Essayouti library in the shadow of the Sankore Mosque. Entrance to the Al-Wangari Library. Entrance to the Mamma Haidera library. But before we go inside, a comparative reminder of the entrance to the Alimame Choffer library, highlighted in yesterday's post. Inside the Mamma Haidera library. Cataloged and protected manuscripts in a climate controlled environment. The way it should be done. Photo archiving workstations recently installed at the Mamma Hadeira library. Women working on restoring and preserving manuscripts at Mamma Haidera. Me, Sigrid, and Hamidou outside the door to the ancient university that housed many of these manuscripts centuries ago. The focus of our few days in Timbuktu are the ancient manuscripts and libraries of Timbuktu and the Herculean effort to preserve them. A primary impetus for our planning this trip now, was my brother Harlan's involvement in one such project to digitally preserve some of the manuscripts. I will not attempt here to summarize the history of these manuscripts and/or Timbuktu as a center for scholarship in the 16th century. This information is readily available in books and on the web. Suffice it to say that in it's heyday there were more books and manuscripts in Timbuktu than in all of Western Europe combined. By an order of magnitude. Many of these manuscripts have traversed time in the hands of families of Islamic scholars and teachers who have held, hidden and protected them across the centuries. Sunday, before our tour travel companions departed for Bamako and home, we toured one such family library as a group - the Mamma Haidera library* (pictured on the left). Tuesday, after the group left, our Trans-Africa travel guide Bouj took Sigrid and I to visit the Allimam Chaffa library (pictured on the right). The contrast in these two libraries illustrate the promise and problem in preserving this legacy of human intellectual achievement. Since 2001, the Hadeira Library* has been associated with a South African led effort to preserve their manuscripts and the collection is housed in a building expressly for that purpose. The manuscripts are cataloged and protected in glass cases, plastic sleeves, and wooden bookshelves. The Chaffa Family Library is without financial support, is unwilling to sell or permit the manuscripts to pass out of family hands, and as a consequence the manuscripts are housed in a mud brick house, uncatalogued, protected from flash flood water damage by raising it on wooden crates, id stored in old suitcases, trunks, and makeshift bookshelves. Some of the manuscripts show significant termite damage. I am in no position to opine on the relative historical significance of these libraries. Certainly the Choffer library has no less interesting a background. The Chaffa library was the property of the Iman of Araouane, a desert town we visited on camel a few days before. The town was once a rich community serving as a desert “port” for caravans crossing the ocean of sand to and from Timbuktu. Now it has shrunk to a population of a few hundred, that eke out a living by servicing the dwindling desert caravans, supplemented by the tourist trade. About 100 years ago, the library was moved to it's current location in Timbuktu, pictured on the right in these photos. The man in blue is Allimam Chaffa, the son of the Iman of Araouane. He continues the family tradition of protecting and teaching from the manuscripts to students in Timbuktu. We left him a small contribution. It was not enough. We think that Bouj brought us here in a vague hope that we can help publicize the plight of this historical treasure trove. Tonight we dined with Harlan's associate Hamidou Ongoiba and his Toureg friend and interpreter Mohamed on the outdoor rooftop dining room of our hotel La Maison. There we planned our last day of activity in Timbuktu, including further exploration the libraries and the project Harlan and Hamidou are participating in to digitally preserve the manuscripts.